Domestic violence is a serious infraction and has the potential to harm victims physically, mentally, emotionally and economically. 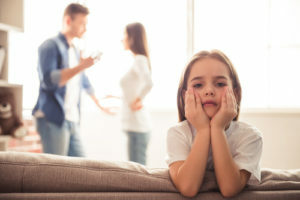 In the state of Arizona, perpetrators of domestic violence can end up negatively impacting their child custody privileges. These violent acts become domestic violence when committed against a family or household member. Perpetrators of this brand of violence can have both their legal and physical child custody rights affected. Legal custody is what gives a parent the right to make important decisions in regard to the child. These can be things like education and health-related decisions. Physical custody constitutes matters like basic daily care and where a child resides. Arizona courts will view domestic violence as something in direct contrast of the best interests of the child when trying to determine custody. Therefore, a parent guilty of domestic violence (with proof) well be less likely to get custody, including joint legal custody. Perpetrators of domestic violence will also see their parenting time (Arizona visitation rights) impacted by their actions. Arizona courts keep the victimized child’s and/or parent’s safety the top priority. If they feel the abusive parent is still a danger to the child and their emotional development, they can elect to not reward parenting time. If the abusive parent can convince the courts that parenting time would not be a danger and the court agrees, they can still take steps to make sure mistakes do not happen. This means things like supervised parenting time, having parenting time in a protected setting, banning overnight visits, making the abusive parent pay for any costs associated with parenting time, etc. In serious matters, if the perpetrator ends up displaying a pattern of child abuse or has a history of it, relative, physician, foster parent, licensed welfare agency, or the Arizona Department of Economic Security can file a petition for the termination of a parent’s rights. This would effectively remove both physical and legal custody of the child from the abusive parent. Again, domestic violence is a serious infraction and seeking the help of an experienced attorney can help you keep your family safe. In Arizona, the Law Office of Karen Schoenau has the tools to take every action necessary to help you achieve the results you depend on. To speak with an attorney concerning your situation, call today at 480-845-0251 or toll free at 888-689-5356.